The Board of Trustees believes it is essential for them to have a comprehensive overview of the community residency status at all times for the safety and benefit of all residents. This Policy Statement will outline the guidelines established for the registration of all individual property units by their Owner(s) within Bear Hollow Village. In accordance with the Association By-Laws and Articles 3.3 and 4.1. et.seq. of the Second Amended Restated and Confirmatory Declaration of Protective Covenants, Conditions, and Restrictions for Bear Hollow Village (CCR’s) the Board of Trustees for the Homeowners Association is empowered to promulgate Rules & Regulations for the proper and safe management of the community and to initiate enforcement actions for violations of the CCR’s and the Property Registration Policy. (For purposes of this registration a short term basis is defined as being less than 30 days in length. More than one short term rental can occur during any year at the discretion of the individual property Owner(s). PART TIME RESIDENT(S) & PROPERTY NOT RENTED. 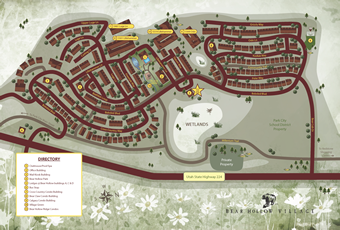 The Bear Hollow Village Homeowner’s Association will provide specific FORMS to be used by each Owner to register their property under one of the above categories. to report all required information as per their property category / classification. remedy the violation(s) they are made aware of. Owners will be afforded thirty (30) days from the effective date of this Policy to provide the Board of Trustees with an initial completed property registration form for their property using one of the forms provided. All enforcement actions for violations of the Property Registration Policy as outlined herein are enforceable by the Homeowner’s Association against the Unit Owner/tenants and / or guests present in the community at the sole discretion of the Board of Trustees. The Board of Trustees will assess monetary fines, suspension of Owner privileges, request assistance from the Summit County Sheriff or other Summit County officials, or any combination thereof, to deal with Policy violations as they deem appropriate. Owners who fail to register their properties with the HOA in accordance with this Policy will also be subject to the above enforcement actions. Should it become evident that a repeated violation of community rules / Policy is occurring at any property, or from any Owners, renters, guests in the community after a warning of the violation(s) present has been given, verbally or otherwise, this will result in severe monetary fines against Owners and/or their tenants/guests and prosecution against any/all persons in violation of the Utah Code statutes while in Bear Hollow Village. Should it become necessary to request the Summit County Sheriff to respond more than once to any specific property or disturbance for a recurring violation of community rules or Policy, after a first warning has been delivered, then the Board of Trustees will request the Sheriff to make arrests for violation(s) of any Utah Code statutes applicable for the repeated violations. This Property Registration Policy shall become effective MAY 1, 2012. The Property contains __________ bedrooms and has a maximum total sleeping capacity of ____________ persons. NOTE : A maximum of 2 pets are permitted / per Unit/Owner. NOTE : A maximum of 2 pets are permitted / per Unit/Owner/ Full time tenant. Short term tenants are NOT PERMITTED TO HAVE PETS IN THE RENTAL UNIT. Indicate YES or NO We have the following website to describe our property to prospective renters. ANY renters in the subject property are made aware of the HOA Rules & Regulations for the community as outlined in the CCRS and as posted on the HOA website www.bhvhoa.com - especially Noise Rules ( after 10PM) and Vehicle Rules & Regulations (parking). ANY rental contract for renting the subject property contains an EVICTION CLAUSE that clearly specifies that tenants / occupants in my unit can be evicted for violation of the terms of the rental contract or for disorderly conduct/behavior in violation of the Utah Code. ANY rental contract for renting the subject property requires the renters to post a SECURITY DEPOSIT in an appropriate amount to cover damages to the property, damages to community common areas caused by the tenants or their guests, or for fines imposed by the HOA for violations of community rules (CCRs) or Policies.